Make sure to select FACE mode before disconnecting the cable from the negative (-) battery terminal. (a) Using pliers, grip the claws of the clip and slide the clip to disconnect the outlet heater water hose. Do not apply excessive force to the outlet heater water hose. 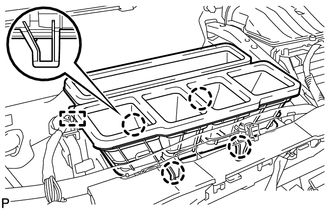 Prepare a drain pan or cloth in case the coolant leaks. 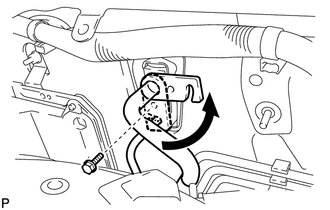 (a) Using pliers, grip the claws of the clip and slide the clip to disconnect the inlet heater water hose. 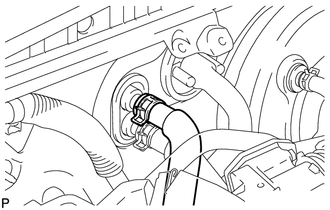 Do not apply excessive force to the inlet heater water hose. 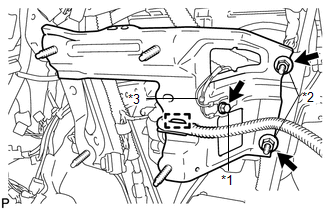 (a) Remove the bolt, and slide the hook connector. (b) Disconnect the suction hose sub-assembly. 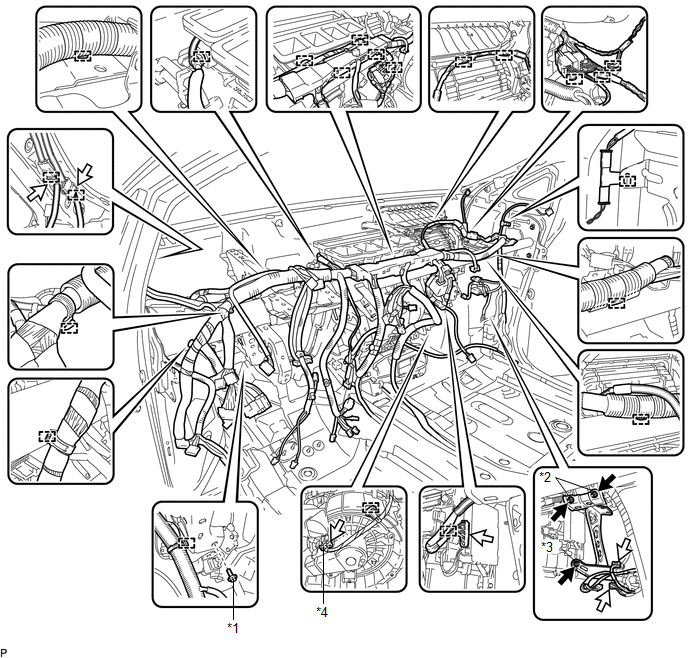 (c) Remove the O-ring from the suction hose sub-assembly. 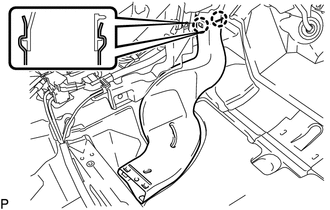 (a) Disconnect the air conditioning tube and accessory assembly. 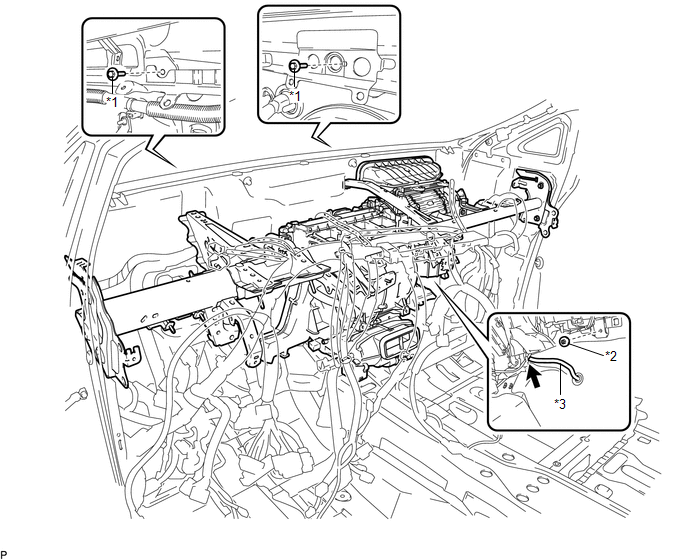 (b) Remove the O-ring from the air conditioning tube and accessory assembly. (a) Turn back the floor carpet. (b) Disengage the 4 claws and remove the rear No. 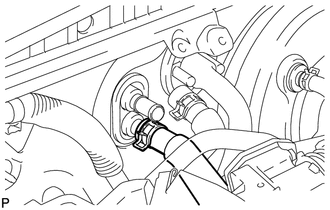 2 air duct as shown in the illustration. 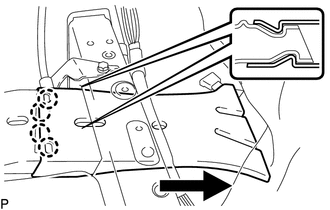 (a) Disengage the 2 claws and remove the rear No. 1 air duct. (b) Remove the 3 clips and floor carpet bracket LH. 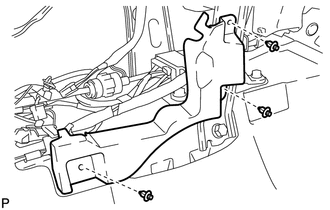 (b) Disengage the 4 claws and remove the rear No. 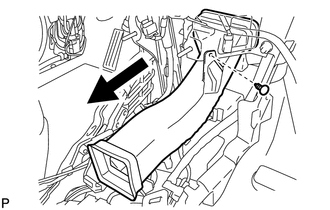 4 air duct as shown in the illustration. 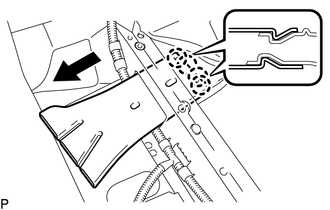 (a) Disengage the 2 claws and remove the rear No. 3 air duct. (a) Remove the 3 clips and floor carpet bracket RH. (a) Remove the clip and No. 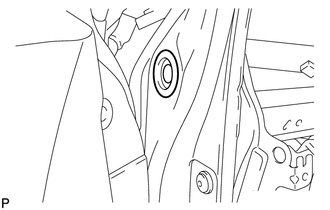 1 console box duct as shown in the illustration. (b) Disengage the 4 claws and remove the No. 6 heater to register duct assembly. 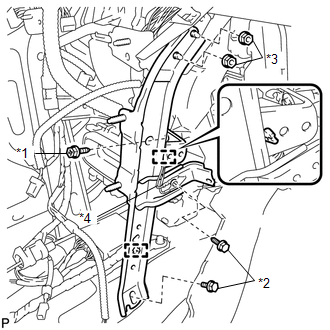 (b) Remove the bolt and disconnect the earth wire. (c) Remove the 2 nuts and No. 3 instrument panel reinforcement. (c) Remove the bolt and disconnect the earth wire. (d) Remove the 2 bolts, 2 nuts and No. 1 instrument panel brace sub-assembly. 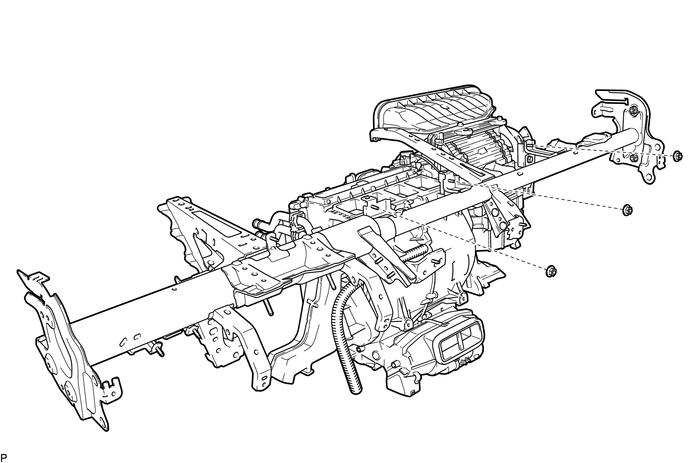 (d) Remove the bolt, 2 nuts and No. 2 instrument panel brace sub-assembly. 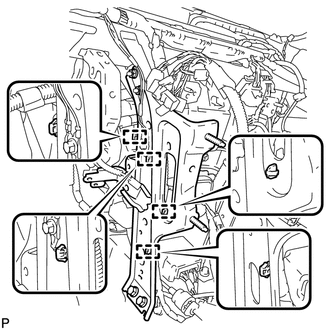 (a) Remove the bolt, 2 nuts and screw. (b) Disconnect the blower motor connector. 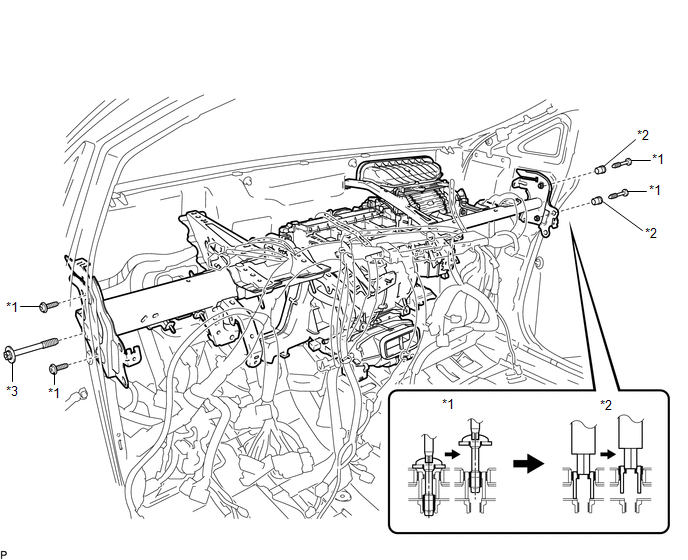 (e) Remove the 2 bolts from the engine compartment side. (g) Disconnect the cooler drain hose. (1) Remove the hole plug. (j) Using a T40 "TORX" socket wrench, remove the 4 "TORX" bolts. 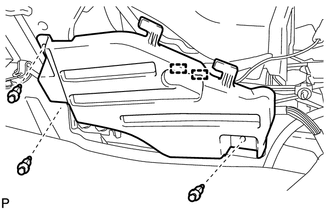 The "TORX" bolts on the passenger side may be removed with the collars for adjustment. 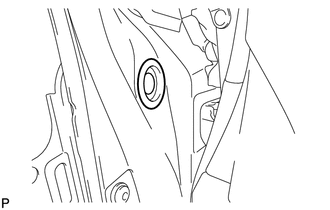 (k) Using a 12 mm hexagon wrench, remove the 2 collars. 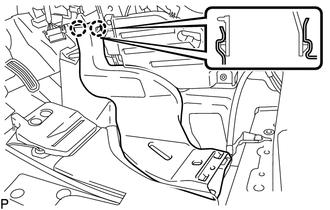 (l) Remove the bolt and the instrument panel reinforcement assembly with air conditioning unit assembly. 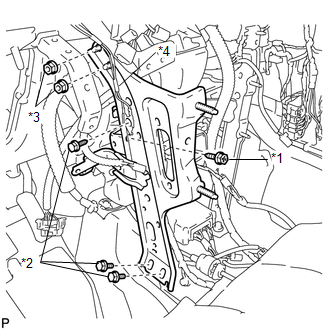 (a) Remove the 3 nuts and air conditioning unit assembly from the instrument panel reinforcement assembly.